The next time your job site in Miami needs junk pickup, consider the professional, reliable team at XS Trash. We understand that construction debris that is left on your job site can be hazardous. By booking full service care with the team at XS Trash, we'll clear your job site promptly. We offer more than just junk removal, we also provide comprehensive job site cleanup, removing construction debris, appliances, furniture, and more. Give us a call to learn more. 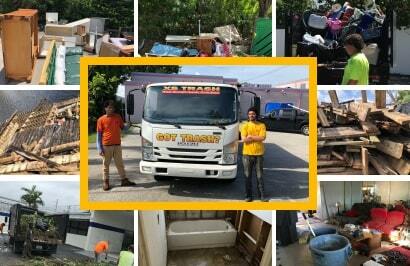 Established as one of the top companies in Miami for junk pickup, XS Trash continues to surpass the competition with our ability to handle all jobs, both large and small, with timely service with a smile. The ability to set your pickup schedule, with same day pickup by special request, and our flexible service options continually allow us to provide client with high quality service. XS Trash always displays the highest standard of service when working in Miami, with junk pickup services provided as an excellent way to handle removal of heavy materials like carpeting, metal siding, furniture, and concrete. We even haul away any storm debris that may be piling up on-site. Our scheduling options provide the ability to request delivery at a specific time or location. Our team of professionals at XS Trash can provide assistance through several aspects of your job in Miami, where junk pickup is made easy with our 21 yard trucks. With licensed bobcat operators on staff, we are able to provide additional debris removal services without the need for you to hire a second contractor. Call today to learn more about our services! We are a licensed and insured Junk Pickup, Junk Cleanup & Hauling Company.